Please click here to view speaker disclosures. 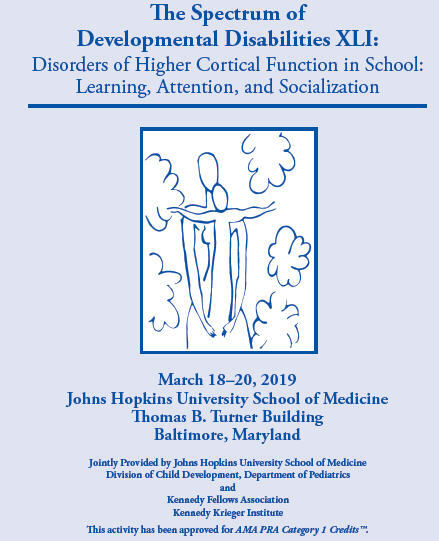 This multidisciplinary, three-day conference will focus on cognitive dysfunction in school-age children. This activity is intended for pediatricians, genetic counselors, neurodevelopmentalists, developmental behavioral pediatricians, child neurologists, child psychiatrists, educators, nurses, nurse practititioners, occupational therapists, psychologists, speech language pathologists, physical therapists, physician assistants and social workers. A $50 late fee applies to registrations received after 5:00 p.m. ET on March 12, 2019. A handling fee of $50 will be deducted for cancellation. An additional fee may apply for cancellation of other events, including workshops and social activities. Refund requests must be received by fax or mail by March 12, 2019. No refunds will be made thereafter. Transfer of registration to another Johns Hopkins activity in lieu of cancellation is not possible. Identify children who are likely to need special education. Identify appropriate evaluations and services for children with academic challenges. Counsel children and families regarding their educational rights under US law. Critically evaluate an educational plan and recommend adjustments when necessary. This activity has been planned and implemented in accordance with the accreditation requirements and policies of the Accreditation Council for Continuing Medical Education (ACCME) through the joint providership of Johns Hopkins University School of Medicine and Kennedy Fellows Association. The Johns Hopkins University School of Medicine is accredited by the ACCME to provide continuing medical education for physicians. The Johns Hopkins University School of Medicine designates this live activity for a maximum of 18.25 AMA PRA Category 1 Credits™. Physicians should claim only the credit commensurate with the extent of their participation in the activity. The American Board of Psychiatry and Neurology has reviewed The Spectrum of Developmental Disabilities XLI: Disorders of Higher Cortical Function in School: Learning, Attention, and Socialization and has approved this program as part of a comprehensive self-assessment program, which is mandated by the ABMS as a necessary component of Maintenance of Certification. Completion of this activity and associated assessment enables the participant to earn 18.25 ABP MOC Part 2 points. PAs may claim a maximum of 18.25 Category 1 credits for completing this activity. NCCPA accepts AMA PRA Category 1 Credit™ from organizations accredited by ACCME or a recognized state medical society. The Johns Hopkins University School of Medicine is authorized by the Maryland State Board of Examiners of Psychologists as a provider of continuing education. The Johns Hopkins University School of Medicine maintains responsibility for this program. A certificate for 18.25 CEUs will be awarded upon completion of this activity. The Maryland Board of Social Work Examiners certifies that this program meets the criteria for 18.25 credit hours of Category 1 or 1.8 CEUs of continuing education for social workers and associates licensed in Maryland. The Johns Hopkins University School of Medicine is an approved sponsor of the Maryland Board of Social Work Examiners for continuing education credits for licensed social workers in Maryland. The Johns Hopkins University has approved this activity for 18.25 contact hours for non-physicians. When Should We Commence Academics? Beyond Academics: What Else is Needed? Neurons and Neighborhoods: What Have We Learned? Learning vs. Thinking: Lessons from Intellectual Disability, Autism Spectrum Disorder, and Specific Learning Disabilities. The Spectrum of Specific Learning Disability: Comorbid or Coexisting Conditions?